I love this song for a variety of reasons. 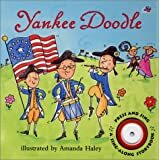 It’s a classic, kids love it, great quarter/two eighth note patterns, and it can be a jumping off point to talk about the Revolutionary War era. I LOVE this video from Sesame Street for kindergarten and first grade. They giggle non-stop. So many cute versions. This one has a trio of girls who are seen in every verse following the dashing young man around. Kids get a kick out of it. It goes through three verses. 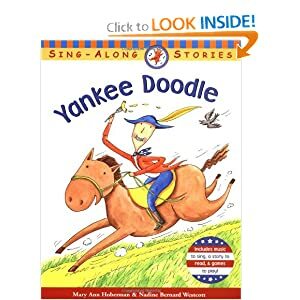 This book by Mary Ann Hoberman takes the story and embellishes it to the point that YD and friends open a restaurant called “Yankee Doodle’s Noodles”. My kids loved it because of the silly word play, fun illustrations, and crazy characters such as a poodle. 1. It has a great steady beat so any activity related to beats, especially marching. 2. It’s in AB, verse/refrain form so the opportunities for STEADY BEAT movement and non-pitched percussion play are endless. With partner do a non-locomotor movement on A, locomotor on B (or reverse it). Play woods on A, metals on B. Get in groups of four, everyone has rhythm sticks and come up with a way to play on A and B. 3. The verse has a beautiful rhythm of two eighths (6x) followed by two quarters to which you can sing whatever rhythm system you prescribe to. ti-ti, ti-ti, ti-ti, ti-ti, ti-ti, ti-ti, ta, ta (repeat) then sing the more complicated chorus with lyrics. As a class, notate it and sing the rhythms. Take rhythmic notation in grades 2 and 3 on the verse rhythm.